Chris Smith - Well also this week, worrying news about what is going on in Mexico. We have seen the emergence of a former flu H1N1 but it is not the former flu H1N1 that we normally see seasonally in humans. This form seems to be a swine, a pig form of the virus. So far there have been a thousand reported cases and maybe as many as 50 deaths and it doesn't just seem to be confined to Mexico because cases have also now been reported in a number of US states, including the adjacent California, also Kansas now and also maybe even New York. So we are looking to see exactly what's going on and joining us is from Cambridge University, internationally renowned flu researcher Paul Digard, who is going to hopefully shed some light on this. Paul Digard - Good evening. Chris Smith - Welcome to the Naked Scientists. First of all, can you just explain for us actually what is swine flu, because we got our heads around bird flu as a risk, how does it compare, what is it? Paul Digard - Well swine flu is influenza A, same as human flu and bird flu but it's a form that's adapted to infect pigs. So history says that pigs had flu for at least last 100 years or so and when you look at the genetics of those strains, it's pretty clear that actually the viruses that infect pigs we have been swapping them backwards and forwards to in pigs and humans for quite a while. Chris Smith - So in the same way that birds have their strain of flu which occasionally jumps into us, pigs have their strain of flu which occasionally jumps into us and vice versa. It is a giant sort of genetic melting pot and on this occasion this strain we are seeing in Mexico is a pig virus that has jumped out of the pigs and into the local population? Paul Digard - Probably, the virus that's been found in people of Mexico and in the US genetically has some characteristics of swine flu but that's not the same as known that has come directly out of pigs into people, we don't really know where it's come from yet. Chris Smith - So speculating for a minute, just talking about the mechanisms as to how it could have arrived, how could it have got out of the pig and enter a person in terms of to arrive at this sort of genetic situation we see with this virus now? Paul Digard - Well, it's speculation because I don't know, I don't know if anybody knows what has actually happened in Mexico but the usual route is as people work in the pig industry, the pork industry, they have close contact with pigs. That's the start of transmission from animal to man and vice versa. Chris Smith - So someone who is a worker, goes to work and comes into contact with a pig, the pig gives that person a pig virus directly, what about the other way round if the person gives their human flu to the pig? Paul Digard - Same situation in influenza in pigs is very similar clinically to human influenza, it's a respiratory disease. The pigs have respiratory distress. They run on temperature. The virus is probably transmitted by most the same route, by aerosol perhaps fur mites, just general close contact will get the virus from one organism to another. 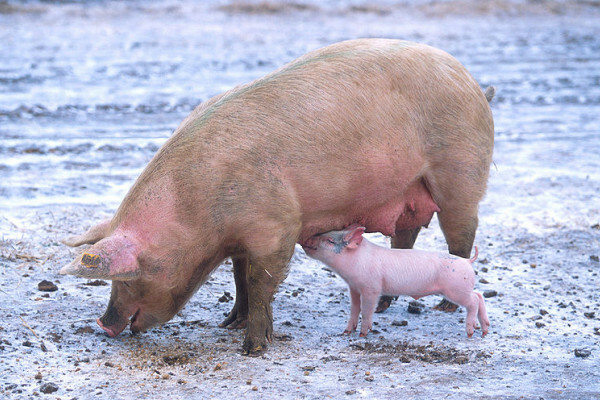 Chris Smith - So if a pig has got it's own form of flu at the same time as human form of flu then infects the pig, is it possible the pig got out like sort of mixing pot and you get out of that a hybrid virus which combines the worst bits of both? Paul Digard - Yes, that's the theory. Pigs have been viewed as a mixing vessel for quite a while partly because we know that we can swap viruses backwards and forwards between pigs but even worse in the ways that pigs are also susceptible to quite a few strains of avian flu but when you look at the genetics of the viruses that you find in pigs it is pretty obvious that not only they are swapping genes between swine and human flu but they are also mixing an avian genes as well, avian virus genes. Chris Smith - So is that why we should be more worried about a form of the virus that's come from a pig than just a normal human flu then? Paul Digard - What makes the current swine flu more dangerous is probably that it's antigenically novel for the human population. Chris Smith - Meaning it looks total differently, we have never seen anything like this. Paul Digard - So you and I and probably most people have heard, we'll have already have H1N1 flu but they will have the human strength and at the moment it is not at all clear whether that gives you any protection from infection with this swine H1N1. Chris Smith - And the fact that you've got to catch flu the first time in some point in your life and most people don't die when they catch the flu, an appreciable number do but most don't, luckily, so why should this one be worse then? What's giving it the edge? Paul Digard - Well we don't know that it is worse and what we know so far is there's perhaps 60 deaths or so but we don't know how many people have been infected so we don't know what the mortality rate is and it could be no more virulent than current human flu, it's just there's a large number of infections that haven't been noticed because they have not been severe enough to the persons that go to a doctor. Chris Smith - And based on what we know about the flu historically and the history has a habit of repeating itself we have had a number of pandemics over the years and most famous that we have got defined is the 1918 Spanish flu, estimated 20 to 40 million people died with that, how does this event fit with what we know about those previous pandemics? Paul Digard - First of all, we don't know that this is going to be the next pandemic. I mean there's a real chance it could be but we don't know. It could just burn out, it could go nowhere, obviously that's what you'd hope. If it does turn pandemic then it's different to the 57 and 68, it would be different from 57 and 68 pandemics because it was those were hybrid viruses between an avian strain and a human strain. Genetically I don't think we can say that we have ever seen a pandemic starting from a pig virus before. The 1918 virus, we don't really know for sure where it came from, probably avian but it's hard to say because we don't know what the virus before was. Chris Smith - But is there any reason why the next pandemic couldn't start with a pig? Paul Digard - Oh no, no, in this I think there's a reasonable chance that in a year's time we'll look back and think yes, this was the start of the 2009-2010 pandemic. Chris Smith - Lets hope not, thank you very much Paul. That was Paul Digard who is a flu virologist at Cambridge University. Previous This Week in Science History - Pasteur Presents "Germ Theory"